Colossal Squid vs. Giant Squid – What’s the difference? In December of 2013, fisherman John Bennett hauled in more then his dinner plate could fit. 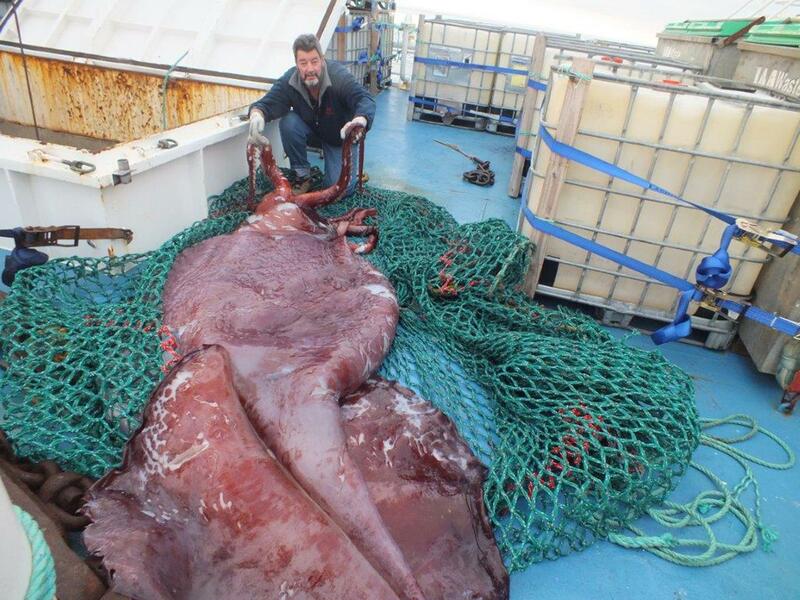 He hauled in a 770 pound colossal squid — not to be confused with the giant squid — from the Antarctic Ocean, still hanging onto the fish that Bennett wanted to catch. After eight months of being held in cold storage, the squid was thawed and dissected by a New Zealand team of squid experts on September 15th, 2014. This was a major discovery for the scientific world, especially since it is the “only second intact specimen [of a colossal squid] ever found,” according to Fox News. The female squid was also found to be carrying eggs, an exciting addition. When asked about the recent colossal squid discovery, many BSGE students were more knowledgable of the giant squid rather than the colossal squid. For example, Thomas Breen ’20 spoke about his experiences with learning about giant squids. The colossal squid is the largest invertebrate, squid, and mollusk in the world. For those who are not science geeks, mollusks are creatures that have mantles which are parts of their bodies that are hollowed out and used for protection and excretion. Most mollusks are marine animals, but there are exceptions to this such as the land snail. One of the interesting differences between the colossal and giant squid, besides their size, is that giant squids have serrated teeth surrounding their tentacle’s suckers, while the colossal squids have razor sharp hooks surrounding their tentacle’s suckers. These hooks spin around grinding up the flesh of the squid’s predator’s and prey, an extremely painful-sounding experience. The reason why so few people know about the colossal squid and are more familiar with the giant squid is that there has only been a relatively recent discovery of the colossal squid. The colossal squid was only heard of in the early 20th century, and evidence of the squid’s existence only in the 1920s. However, actual physical evidence of the colossal squid did not appear until 2007, a mere seven years ago.Whereas the giant squid was first written about and encountered in the fourth century B.C. by Aristotle, who wrote vaguely of a creature that was “5 ells long,” an ell being a Latin unit of measurement. But there are some, including BSGE Senior Sarfi Chowdhury ’15, that are knowledgable of the differences between the colossal and giant squid, and are excited about this recent discovery. Unfortunately, the colossal squid today still remains much of a mystery to us because of its love for deep Arctic waters, making it difficult for humans and colossal squids to interact. But this recent discovery has opened up a world of possibilities of finding out more information on this fascinating creature. Previous Post Opinion: Dear Media, young people are more capable than taking selfies. Next Post Why Is It So Hard To Get a 7 in IB Art?